SDI has also a course pertaining to all the colour stones available in the market. 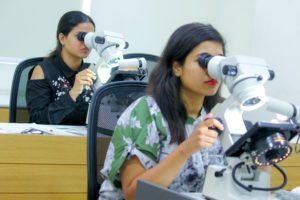 SDI teaches Gemology in which the student is taught how to recognize natural gemstones, their formation and significance, inclusions, treated gemstones. Every aspect of the colour stone has been taught. The student also gets hands on experience by grading them using all the equipments available. Students get to learn more about hundreds of gemstones available in the market. Causes of color in Gemstones. Use of High-end equipment like Jewellers loupe, Microscope, Spectroscope,Dichroscope, Chelsea Color filter, UV light, Polari scope, Refractomer. Differentiating Natural Gemstones from its Synthetics & Simulants. Different types of Synthetics & its Identification. Different types of Treatments on Gemstones. Identification of various Inclusions in Gemstones. Special focus on the major Gemstones available in the market.